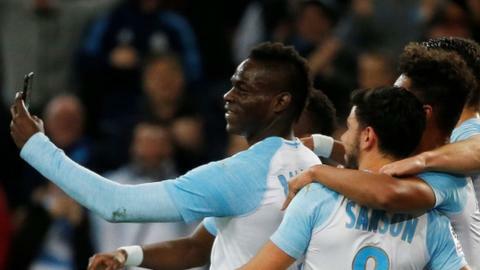 Mario Balotelli scores for Marseille and uploads his celebrations with team-mates to his Instagram story. Kylian Mbappe scores the only goal of the game as Paris St-Germain beat Saint-Etienne to move 12 points clear at the top of Ligue 1. Three more Ligue 1 games this weekend are postponed amid fears of more violent "yellow vest" protests in France over rising living costs. Ten-man Paris St-Germain move a step closer to the Ligue 1 title after a 92nd-minute own goal by Mathieu Debuchy secures a point at Saint-Etienne. Manchester United boss Jose Mourinho says he could tell his players were not focused or motivated in the dressing room.